This Saturday, I went on another MeetUp trip, this time to go skiing! 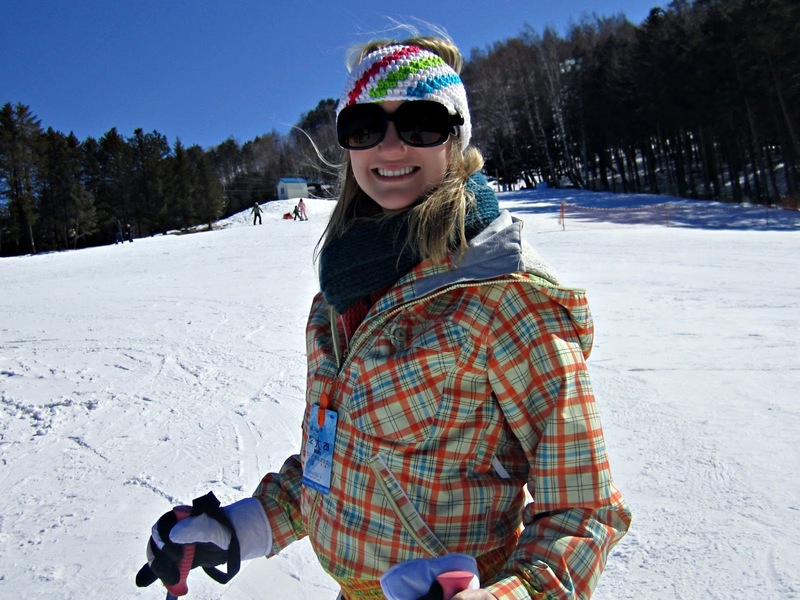 I had yet to go skiing in Korea, so I decided to go for it. 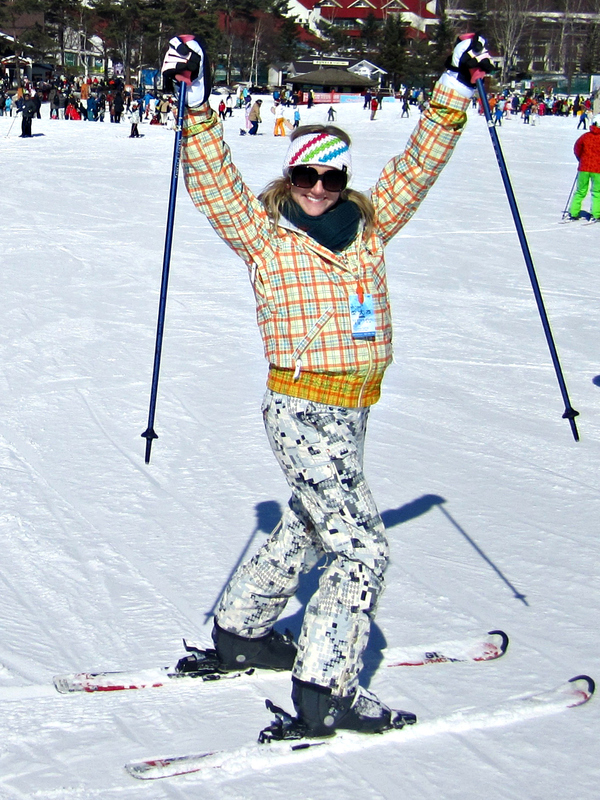 Skiing is very popular, almost as much as hiking in the warmer weather. Additionally, the 2018 Winter Olympics will be held here so I took the opportunity to hit the slopes where that will be happening in a few years. Since the meeting time was 8:30am, Tab stayed the night on my air mattress and we went together. We had to meet at Jamsil station, which is about 20 minutes by subway from my station. I set my alarm for 6:30am, so I'd have plenty of time to get cute. Well, despite waking up about 5 times paranoid that I was going to sleep through my alarm, I in fact DID sleep through the alarm. When I opened my eyes and saw daylight, I knew something was wrong. Sure enough, it was 7:15am! I only had 30 minutes to get ready and leave the apartment if I was going to be on time for the bus. I think I broke my own personal record by showing, blowdrying my hair, and doing my makeup in 25 minutes flat. Thankfully I had packed my backpack the night before, and Tab just needed to straighten her hair to get ready. We left right on time. I was not feelin' the early morning! On the way, we got a text from Harry, the group leader, who said we would be leaving a bit late. So, we didn't have to rush quite so much. At the station, I saw the most beautiful sight: a Krispy Kreme Hot Now sign!!! I got some donuts (a rare treat!) and we met with Harry around 8:45am. We ended up taking a charter shuttle bus that left at 9am. The ride out was around 3 hours, and I took advantage of that in catching up on some sleep. By the time we arrived, it was around 11:45am. We headed into the complex, and got our lift passes. 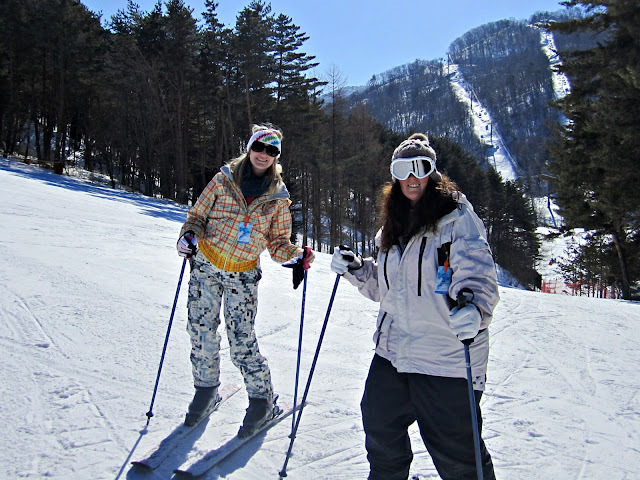 Tab and I had to rent some skiing clothes, since neither of us had invested in any here in Korea. I got the most atrocious, not-matching jacket and pants. I went in the tiny room to change, and found out the hard way that the lights were on a sensor. So, basically, mid-leg with the pants the room went black. I had a moment of "holy cow!" then once I jumped around a bit, the lights popped back on. This happened a several more times by the time I was done. After this, we got our skis. The line was long and the person in front of us was apparently just place holding for about 10 other Koreans to get their stuff. So after about 15 minutes of irritatingly long waiting, I finally got my skis. I had my backpack, my clothes and jacket, boots, and skis, and was getting pretty annoyed with struggling to hold everything. Finally, we made it to the lockers. By that time I was frustrated. I finally got my things stuffed into a locker, as Harry is hurrying me along. I understood he wanted to get out on the slopes to take advantage of the time we had, but I hate being rushed when I feel unorganized and confused. So, I had a mild breakdown. It was definitely a "chelsea move" - I just needed 10 minutes to breathe and get myself together without being rushed along. I needed to feel like everything was in order and I was actually ready, not just being pushed out the door. Basically, I stood there and refused to go on and told Harry to just go. Maybe a bit childish, but at least I know myself well enough to know that, had I gone at that moment, I would have been much more distressed for a longer amount of time. In the end, Tab and I took a few more minutes to get ourselves together. She got some googles, and I got a headband to deal with my static-y mess. Finally, we were ready to hit the slopes! We got on a ski lift to get to the beginner practice slope. The first run down, I was a bit nervous! It had been a couple years since I'd skied, but I guess it's kind of like riding a bike. As soon as I started going, it was no problem! I got to the bottom, and looked around for Tab. She was about 1/3 of the way down! Oops! We did this run a couple times and started to feel more confident. We headed to another beginner slope and Tab got more confident (and therefore faster)! We got some lunch after about 2 hours (ramen for me, some kind of black bean paste stuff for Tab), and went back out. My feet weren't feeling so good, but we only had another hour and a half til we needed to head back to Seoul, so I toughed it out. We went on a different lift to an intermediate run and I am proud to say I conquered that one as well! In fact, I didn't fall the entire day. :D On the intermediate run that we did, I was a bit nervous. With skiing, I am mostly scared of going too fast (feeling like I cannot stop myself and therefore making myself fall), but this time I just talked myself through it -- "Don't freak out, Chelsea. You've got this! As long as no one gets in your way, you'll be fine. It'll level off soon and you'll feel more in control...." And, sure enough, I did it! I felt great after. Although the photo doesn't do it justice, the views we had were fantastic. There is a village built into the side of the mountain right there, and beyond it it a wind energy farm, so just tons of white windmills tucked behind all the immediate mountains. It was a really nice change from the usual concrete jungle I live in. 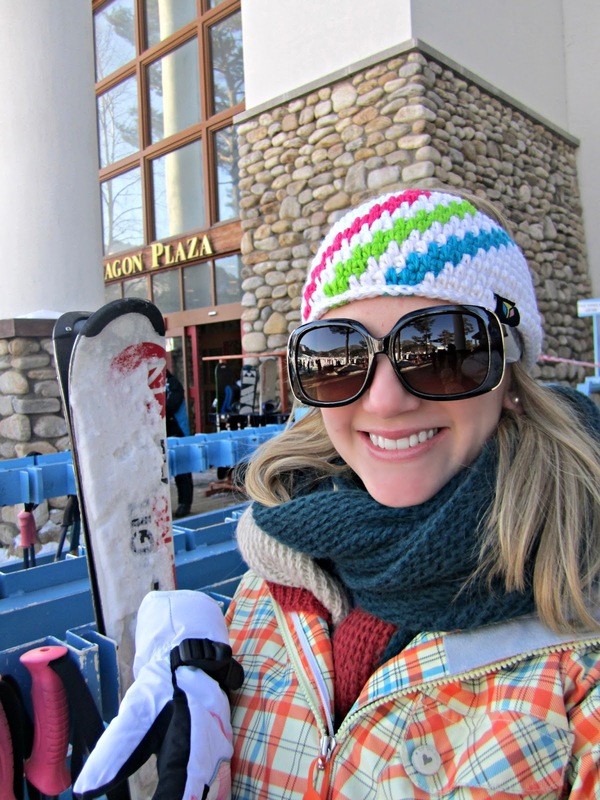 We skied until the last possible minute, then got changed and turned in all our rentals. We got back to the bus right on time and headed back to Seoul. It was a great day away from Seoul doing something I haven't gotten to do in a while. And, I wasn't half bad! :D On the ride home, I knocked out. Only 4-5 hours on the slopes and I was beat! It was totally worth it, though.